Bowe Bergdahl Pleads Guilty To Desertion, Misconduct : The Two-Way Army Sgt. Bowe Bergdahl, who was held by the Taliban from 2009 to 2014 after leaving his base in Afghanistan, has pleaded guilty to desertion and misbehavior. Army Sgt. 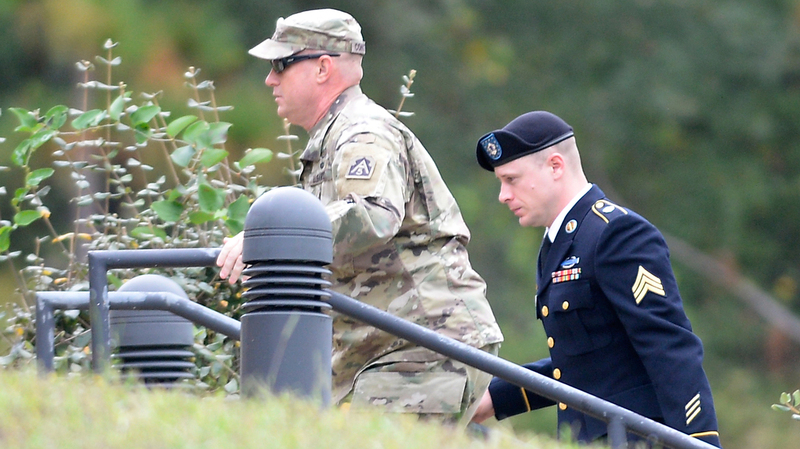 Bowe Bergdahl (right) was escorted into a military courthouse for a hearing in Fort Bragg, N.C., on Monday. Army Sgt. Bowe Bergdahl, who was held by the Taliban after leaving his base in Afghanistan in 2009, has pleaded guilty to desertion and misbehavior before the enemy. Bergdahl was freed in 2014 in exchange for five Taliban detainees. Bergdahl, a native of Idaho, pleaded guilty before the military judge in the case, Army Col. Jeffery R. Nance, at a hearing at Fort Bragg, N.C., on Monday, according to The Associated Press. The AP adds, "It's not clear if Bergdahl, 31, has a deal with prosecutors to limit his punishment, or if he's simply pleading guilty in hopes of leniency from Nance. The misbehavior charge carries a maximum penalty of life in prison, while the desertion charge is punishable by up to five years." Questioned by Nance, Bergdahl said, "I left my observation post on my own," CNN reports, adding that the soldier also said, "I understand leaving was against the law." The guilty plea comes more than two years after the charges were filed. Earlier this year, Bergdahl's lawyers said their client wouldn't be able to get a fair trial, citing dozens of comments about him that were made by President Trump dating to 2015. June 2009: Bergdahl is captured by the Taliban after leaving his base in southeastern Afghanistan. Almost immediately, questions arise about the circumstances of his capture. May 2014: Bergdahl is freed in exchange for five Taliban detainees who were being held at the military prison in Guantánamo Bay, Cuba. March 2015: The U.S. Army charges Bergdahl under two sections of the Uniform Code of Military Justice: Article 85 (Desertion) and Article 99 (Misbehavior before the enemy). During his captivity, Bergdahl was shown in several Taliban propaganda videos; the insurgent group also filmed the exchange that granted his freedom, showing a helicopter landing and soldiers collecting Bergdahl before taking off again. The prisoner trade for Bergdahl inflamed debate — particularly as Trump and others have variously said that five or six soldiers died in the effort to locate and rescue the soldier. "I have personally gone back and asked that question inside the Pentagon, in the Army, in all of our reports. I have seen no evidence that directly links any American combat death to the rescue or finding or search of Sergeant Bergdahl. And I have asked the question. We have all asked the question. I have seen no evidence, no facts presented to me when I asked that question." But while it seems no U.S. personnel died in the effort to find Bergdahl, at least two were wounded — and Nance decided over the summer that evidence regarding those injuries should be considered. As Stars and Stripes reports, "The judge ruled that a Navy SEAL and an Army National Guard sergeant wouldn't have wound up in separate firefights that left them wounded if they hadn't been searching for Bergdahl." Legal questions about the case have extended beyond Bergdahl. In August 2014, the Government Accountability Office said the Pentagon "didn't give enough notice to Congress and misused nearly $1 million" in handling the prisoner swap. In addition to using money that was already appropriated for other uses, the Defense Department didn't tell members of Congress about the swap until the day after it was made. In response to those findings, the Pentagon said it had to act quickly to secure Bergdahl's safe return; Hagel said the circumstances were both extraordinary and unique. Some of Bergdahl's most complete comments about his experience came in the second season of the Serial podcast, which was published in late 2015. As NPR's Eyder Peralta reported, Bergdahl said "he left his post to try to stir controversy in order to get the attention of top military officials so he could explain problems he saw in the Army." But he soon realized it was a mistake — as Bergdahl said on the podcast, "Suddenly, it really starts to sink in that I really did something bad. Or, not bad, but I really did something serious."